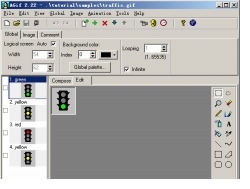 An animated GIF (Graphics Interchange Format) file is a graphic image on a Web page that moves . is not really a video format. It is a sequence of GIF frames stringed together. Due to the 256-color limitation of GIF, the color is dithered. The compression is not that great, so the file size tend to be large given the frame rate and resolution. With Animation gif maker , you can create fabulous animated GIF images for the Web. 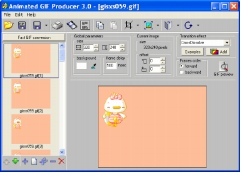 You can even create movies using pictures or graphics created or edited in any image editing program, including Windows Paint, Adobe Photoshop and dozens of others . 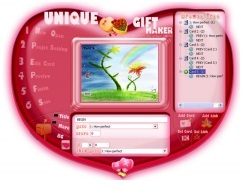 Below is some gif maker free trial software , Now you may download it to make an animated GIF file yourself. Animated GIF Producer is a quick and remarkably easy-to-use tool for creating various animations, buttons and banners that will make your website shine. 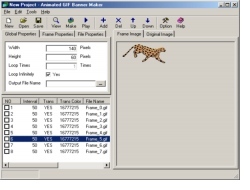 You can create an engaging GIF animation from the blend of images, captured video snapshots and multipage files. To make your animation look and behave the way you want, you can customize a multitude of settings, including frame position, size, and delay among many other parameters. You can also apply special effects make a transition from one image to another coherent and smooth.